With the weather rapidly turning colder, winter will soon be on us and out comes a bike’s worst enemy. Salt. 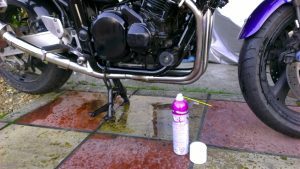 Spread on the roads to tackle ice, it literally eats our bikes, accelerating the oxidisation of ironwork causing your downpipes, frame and anything else exposed to rust and disintegrate before your eyes. Now is the time to take preventative action to tackle this problem. 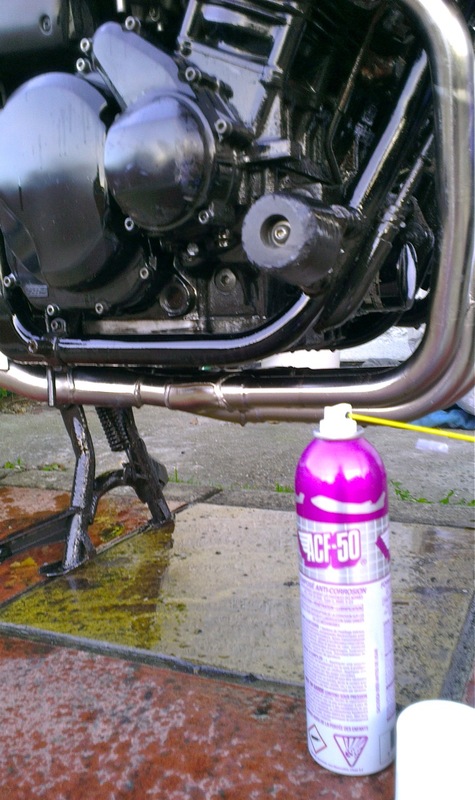 ACF50 is an amazing product you can just spray onto your bike, totally covering it (just stay away from brakes), whence it will leave a protective film that halts any existing rust and preventing further rust. And so, at the weekend I gave the bike a good clean, removing a lot of the grime and dirt, then completely doused it in ACF50. You can pick up a can yourself of ebay fairly cheaply (~£14) or you can get larger volume for use with a pressurised spray system. Some companies offer this latter approach as service, for those feeling lazy. 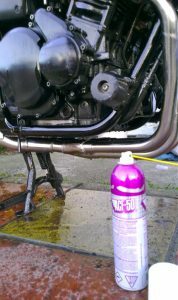 It helps to remove the odd fairing panel to get access to the engine and other hidden metalwork that needs protecting. A single can will just about cover one bike. Get a couple to be more thorough, or more for reapplying more in a couple of months. The resultant film dries clear with just a glossy appearance hinting at its presence. Do bear in mind any ACF50 on the downpipes will soon get burnt off, resulting in a big plume of (harmless) smoke when you first set off. Also, watch out for excess dripping on the floor, it’ll be super slippery once dry! Some people will swear by WD40, and although a good water displacement formula which in itself can help prevent rust, it doesn’t leave a protective film for longer lasting protection.